BSA Space – Register Now – Earn 1 LU/HSW! Two weeks from today something truly unprecedented is happening! We will be giving our first-ever live continuing education course at the BSA Space in downtown Boston. Don’t wait – register today, before seats fill up! Our program starts with The Third Tower: Solving the Collapse of World Trade Center 7, a 50-minute presentation and 10-minute Q&A that architects can earn one LU/HSW for attending. That’s followed by a 30-minute presentation by Dr. Leroy Hulsey, PE, about his ongoing computer modeling study of WTC 7’s collapse. Our back-to-back presentations are being offered twice on Friday, December 16: The first session is from 12:00 PM to 1:45 PM, the second from 6:00 PM to 7:45 PM. We hope you’ll be able to attend one of them! 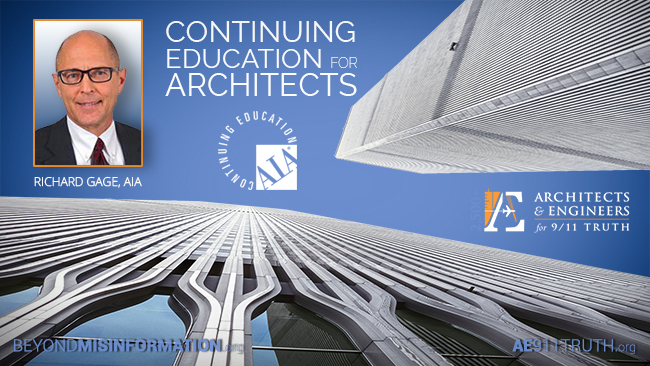 If not, you can still take one of our online AIA CES-approved courses and earn learning units. Also, please help spread the word about the BSA Space event by forwarding this email and/or sharing this flier with all of your colleagues. We look forward to seeing you on December 16!